Is what Tim Cook stated at the recent Apple event in September and this future is already upon us with an increasing amount of TV content streamed through mobile devices and apps. The newly announced tvOS SDK is something for iOS developers to get excited about. For the first time we will be able to create apps for the new Apple TV and publish them to the App Store. This is a great opportunity to deliver content and great user experience through apps to the big screen in everyone’s living room. 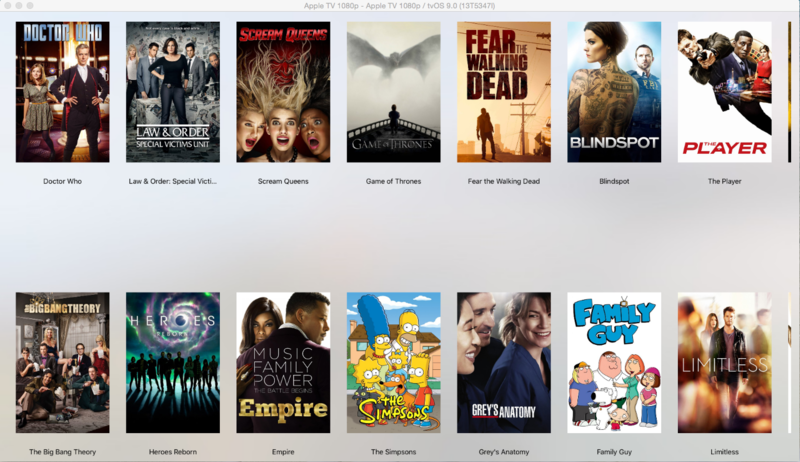 Let’s dive right in and take a look at the tvOS SDK. We’ll cover the basics of each new framework, identify their purpose and describe what the requirements to make an app. Armed with our newfound knowledge, we will create a simple custom tvOS app step by step. There are two types of applications for tvOS. These apps use the latest iOS frameworks and are similar to traditional iOS applications for the iPhone and iPad. You can use storyboards or code to create user interfaces. TVML is Apple’s custom markup language and is used to create interfaces. It has an XML style and if you know HTML you will find it familiar. Apple has made a set of reusable TVML templates available to help you get started. You can find a detailed description of these templates here. More information can be found in the TVJS Framework Reference documentation. See the TVMLKit Framework Reference for more details. TVServices is the framework that allows you to add a top shelf extension to your app. 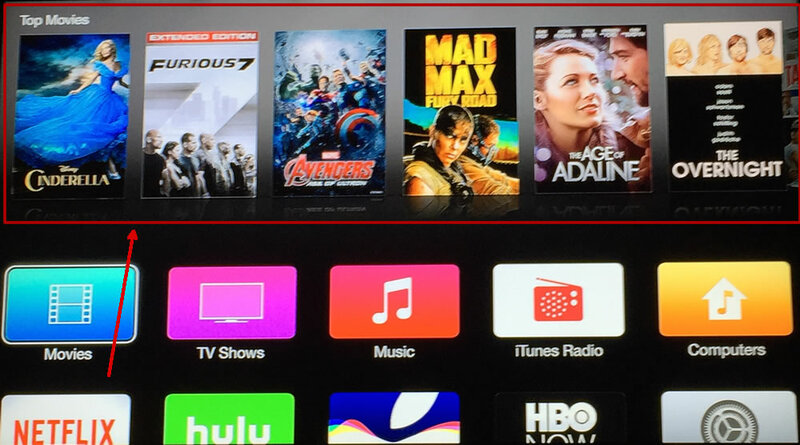 The top shelf is an area of the Apple TV home screen dedicated to displaying content from an application that placed in the first row. It provides an opportunity to display content and information to the user when the focus is on the app icon, without the need to launch the app. I like to think of this architecture as the typical website, where all HTML and JS files reside on a web server and the application responsible for rendering them is similar to the users browser. – Application size is limited to 200MB. – You cannot persist data to the device, CloudKit is something you need to get familiar with if you require saving user settings. It’s important to understand that the Apple TV has a new user interface and Apple has defined a set of Human Interface Guidelines specific to the tvOS. You need to be aware that unlike iOS devices the user has limited touch capabilities, (swipe, click and tap) that affect how they can interact with your application. This is what makes focus important for the Apple TV and given that it’s a new concept I would highly recommend you invest some time learning how to support focus in your application. Time to have some fun with the tvOS SDK. We will create an application that makes a call to a TV database API, retrieves a list of popular TV shows and displays them on our TV application. Development for the Apple TV requires Xcode 7.1 which is still in beta. As with anything under development you may face unexpected crashes and slow performance. The API requires a key that you can request for free but you have to register first. 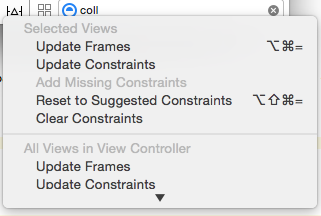 Open Xcode and select a new Single view Application under the tvOS section. 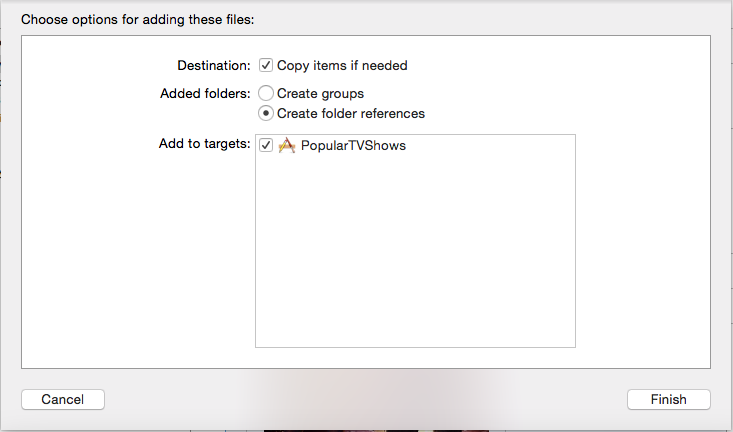 Give the application a name, I named mine PopularTVShows, select a location for the files and click create. Select the main storyboard, you will notice that this is very large storyboard area. This is because we now need to create UI for full HD on a TV. 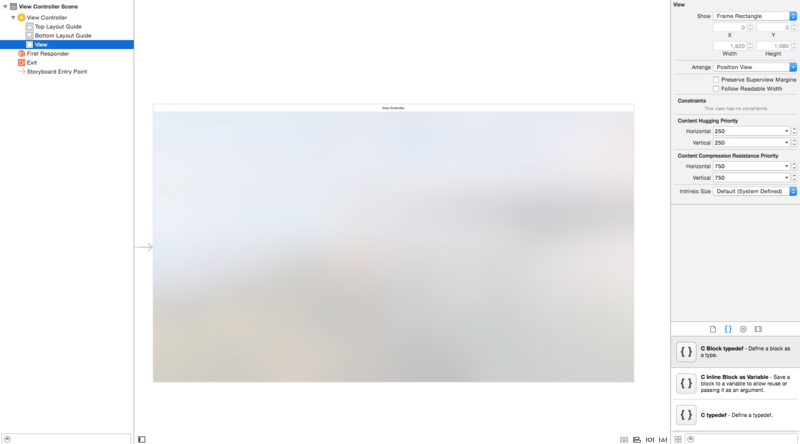 Select the default view, you will notice that by default it’s at 1920 x 1080 resolution. Apart from that difference, everything else should be familiar. You will probably want to zoom out to be able to see the complete storyboard. Start by dragging a Collection View to the storyboard, position it to the top left corner and add zero margin constraints on all 4 sides. The collection view will now take up all the space on the storyboard. On most iOS devices, scrolling, when there is more data that can fit the screen, is usually implemented vertically. For the Apple TV the recommended scrolling direction is horizontal. Set this in the Collection View. Next select the Collection View Cell and give it a custom size of 260 by 430. This cell will contain the TV Show poster and the show name, we gave it a relatively small size to allow for multiple shows to be displayed on the screen. 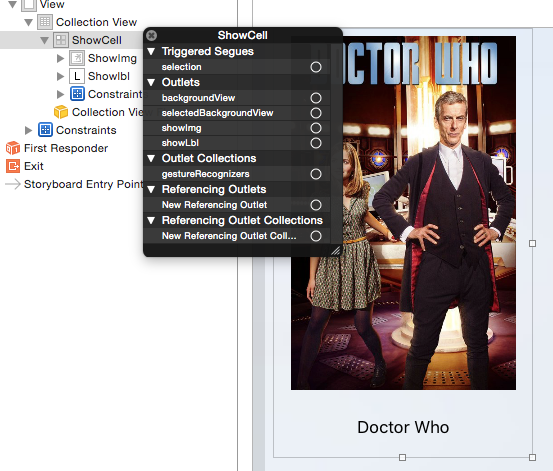 In the attributes inspector assign an identifier of ShowCell. 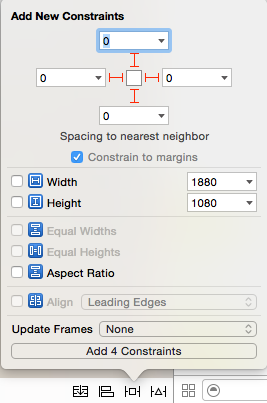 Add the following constraints: top margin 0, width 225, height 354 and align horizontally in the container. 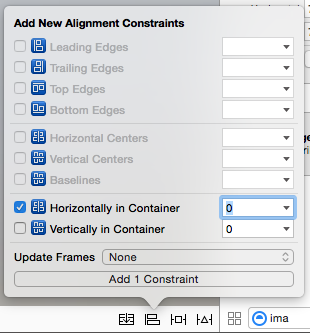 Align horizontally in the container. Set the text to center alignment and change it to any TV show you like, I set mine to Doctor Who. Download the image and drag it into the Assets catalog of your project. Give it an appropriate name, I named mine posterbackground_. 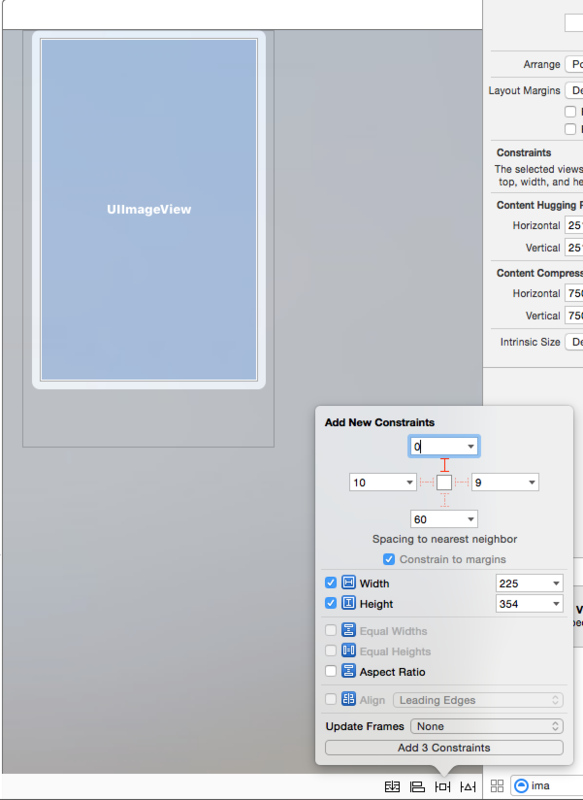 Return to the storyboard, select the image view and set it as the background in the properties inspector. Time to make our API requests and get data in our application. Serializing and deserializing json with Swift can become time consuming because of the optional values. I like to use a framework called SwiftyJSON. It makes the process of working with json much simpler and provides a wrapper that takes away a lot of code management. Download a copy of the framework and make sure you are on the Xcode 7 branch. The easiest way to integrate the library into the project is to drag the SwiftyJSON.swif‘ file into the project, selecting the project target. Great! now we are ready to add some code. Add a new Swift file to the project and name it ApiService. The code has a function that creates a network task with a request, it takes a url as a parameter and returns data if successful or an error if not. This function is generic and can be used for every API request the application will make. Let’s look at the API. To access the data we make a GET request to the following URL : ’http://api.themoviedb.org/3/tv/popular?api_key=‘ including the key at the end. Add the following line of code at the top of the class. Ensure to replace YourKeyHere with your api key. Great, now let’s add another function that takes this url and passes it to the generic function we created earlier, it should then return the data or the error from the request. Let’s create our data objects, these are classes that will contain the data received from the json. We will use these objects to populate the UI elements of the application. If you open your browser and go to the URL added in the code above, you will receive the json data we will work with. It should look like this. – An array of results. – The number of total pages. Let’s create a class that will represent this data structure. Add a new Swift file and name it ApiResults. This creates the page, totalPages and totalResults variables as integers since they will hold the json numeric values. It also creates an array of results. The initialization code takes the json data and assigns the values to the appropriate variables. You probably noticed that we have an ApiTVResult object declared and mapped to the results array. This is going to be our second object that will contain the data of each result, which in this case is the TV show details. Add a new Swift file and name it ApiTVResult. This is all we need to do for our data model. Let’s connect the UI to our code and make the API calls to fetch the data. First, we are going to create a class that will allow us to populate our collection cell. 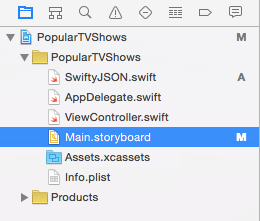 Create a new Swift file and name it ShowCell. 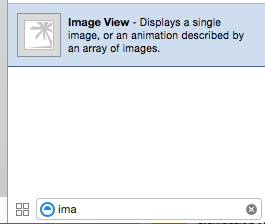 @IBOutlet weak var showImg: UIImageView! @IBOutlet weak var showLbl: UILabel! let url = NSURL(string: path)! let data = NSData(contentsOfURL: url)! This code creates an outlet for the TV show poster and another for the TV show title, named showImg and showLbl accordingly. It contains a function that takes the ApiTVResult object, assigns the title to the label and uses the poster URL to download the image asynchronously and populates the imageView. Right click the ShowCell and connect the showImg outlet by selecting the + next the outlet name and dragging to the poster imageView. Repeat the step above to connect the showlbl outlet to the title label. That is all that is required for ShowCell. Now lets connect the CollectionView to the ViewController. Return to the storyboard, right click on the collection, select the + next to new referencing outlet and drag to the yellow View Controller icon. Select the viewCollection. 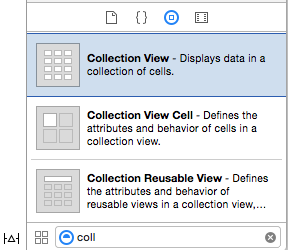 We just added a number of protocols to the CollectionView, these are the minimum required implementations to add data and control the layout of the view. Lets implement them. Start by deleting the following code as we will not be performing any actions with it. We stated that the ViewController will act as the source of data and the delegate for the CollectionView. Before we implement our protocols, we should create a function that will call the API and populate our objects, this way we can assign the appropriate data to the CollectionView. This variable will contain an array of TV Shows. Create a method to make the API call using the ApiService created earlier. In the code above, once the API call has succeed and we have the json data, we populate the ApiResuts objects. Then we assign to the viewController variables the data contained in the results. 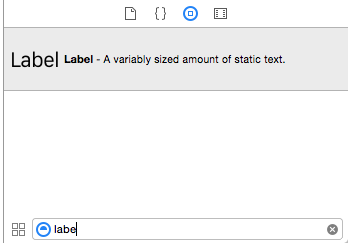 Here you can see how the SwiftyJSON library assists with serialization and population of the objects. The code here is standard for a protocol implementation. 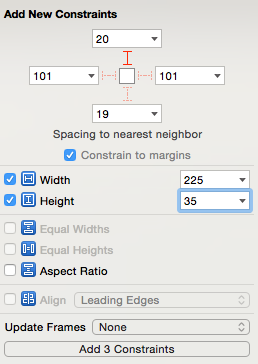 In the numberOfSectionsInCollectionView we return 1 as we will only have a single category in the UI. In the numberOfItemsInSection we return a count of the TvShows in the data. Basically we say that we want to display as many items as TVShows returned from the API. In the layout we set the size of our item to the size of the showcell in the storyboard. Finally, in what looks as the most complex piece of code in the cellForItemAtIndexPath, we create a cell based on the ShowCell class we created earlier. 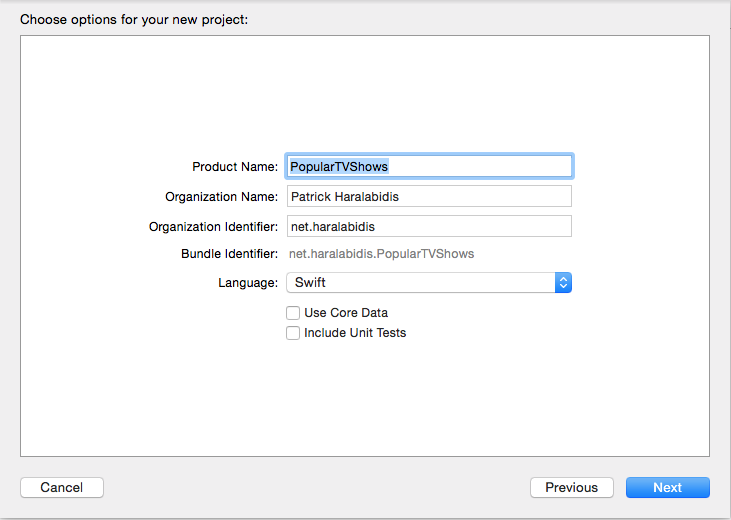 We select the TVShow from the tvShows array based on its index and execute the configure it to display the required data. Now for the exciting part… Let’s run the application! 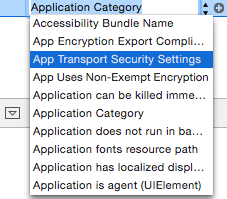 iOS 9 now requires the explicit use of the HTTPS protocol for transferring data in applications. Since our API calls are currently HTTP we need to enable it in the application settings. Set Allow Arbitrary Loads to yes. This will allow all types of connections for the application. If you managed to follow along you should now be seeing sucess! The app displays TV Shows with their respective posters and titles. But there is still something missing. On Apple TV focus is important, and navigating between elements in the application requires it. Let’s implement one last function that will help with this. This creates a variable that contains the original size of our cell and one slightly bigger value. Add a function that will change the size of the cell when focused to make the selection visible to the user. Run the application again and swipe on the TV Remote, you should be able to see which item is now selected. This completes our application. 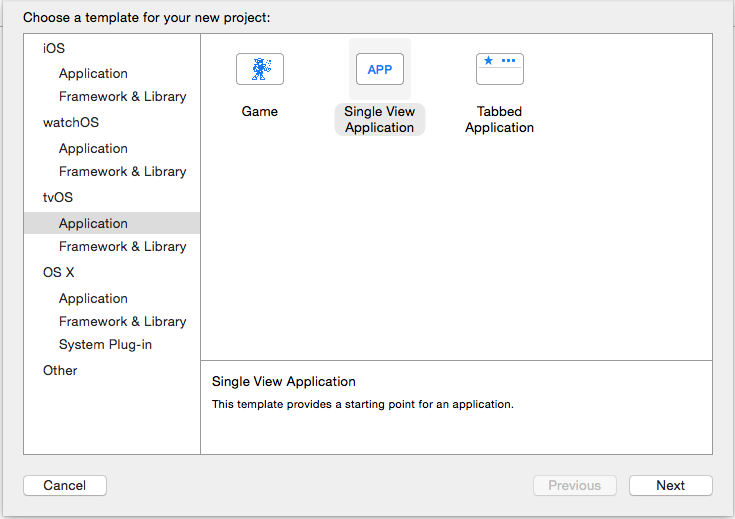 Experienced iOS developers will find creating application for tvOS familiar. There’s a small learning curve, especially around the UI design and user interaction, but it’s worth the effort. For those interested in serving media and large content, TVML applications provide an easy way to do so while using familiar web technologies. For those new to iOS or mobile development there is no better time to jump in. The skills you will acquire developing for custom tvOS apps will be transferable to iOS later. The Apple TV will provide a new platform for custom applications and it will most likely have it’s own independent App Store. It’s not everyday that an opportunity like this presents itself to developers. I already have list of applications that I would love to use on the big screen of my TV and I’m looking forward to enjoying the content and experiences you will provide while holding a Siri remote in one hand and some pop corn on the other.